Once again, we continue our ongoing look at Brewer News, the club newsletter published throughout the year to keep fans appraised of the latest news and upcoming events. This is Volume 3 Number 4, from August of 1945. We've previously seen April and September from that year. This issue is dominated by the safe return home of a beloved figure. 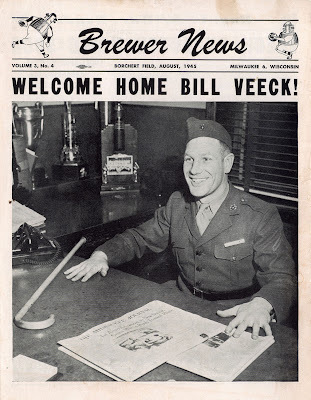 Team president and part-owner Bill Veeck had enlisted in the United States Marines in late November of 1943. 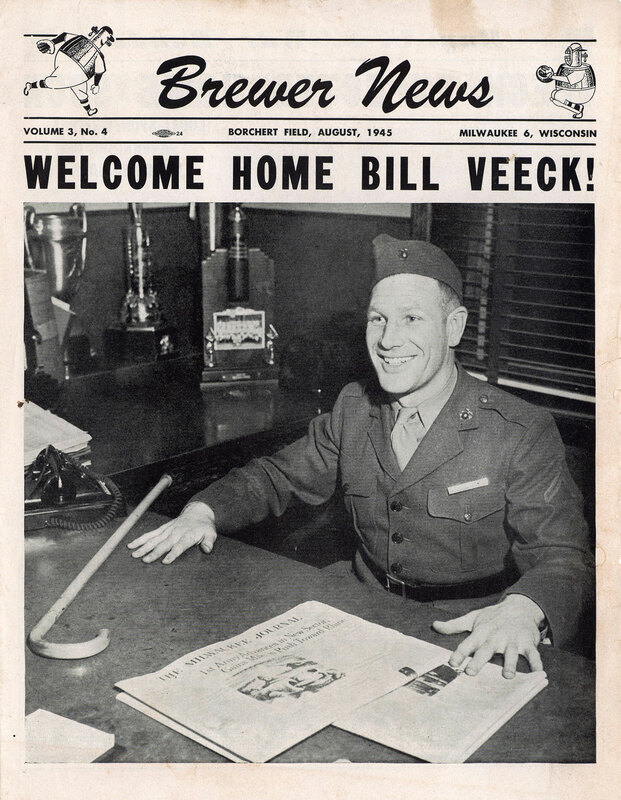 After being injured during during the Bougainville campaign, Veeck began the long process of recovering and assimilating back into Stateside society. 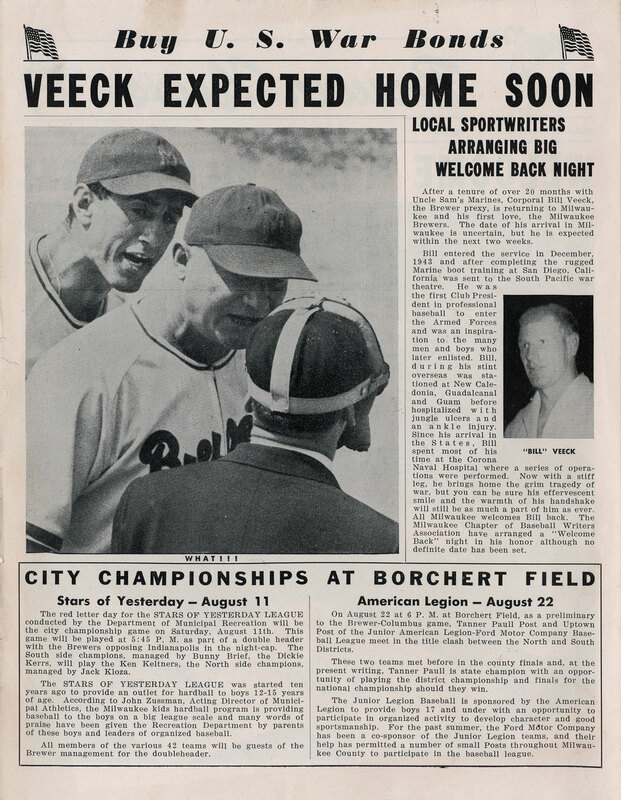 Beginning, of course, with a trip to Borchert Field where Veeck posed at his desk, still wearing his duty uniform. 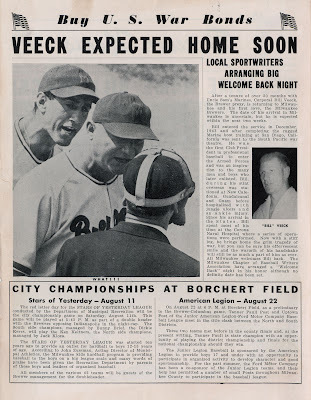 This must have been taken close to press, as the top story on page 2 deals with Veeck's expected return "within the next two weeks." That's a great photo of tomato-faced Brewer manager Nick Cullop. I especially like the caption: "WHAT!!!" I'm guessing he didn't agree with the umpire's call. Note the plug for the upcoming "STARS OF YESTERDAY" league championship game. The Stars of Yesterday was a youth league run by the city Department of Municipal Recreation. 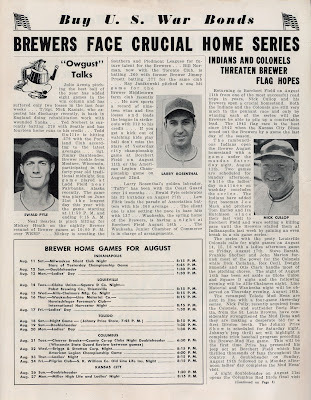 All forty-two teams were named after former Brewer players, in this case Dickie Kerr (who played for the Brews in 1917 and 1918 before being sold to the Chicago White Sox) and Ken Keltner (a local boy made very good). Here's an interesting character. 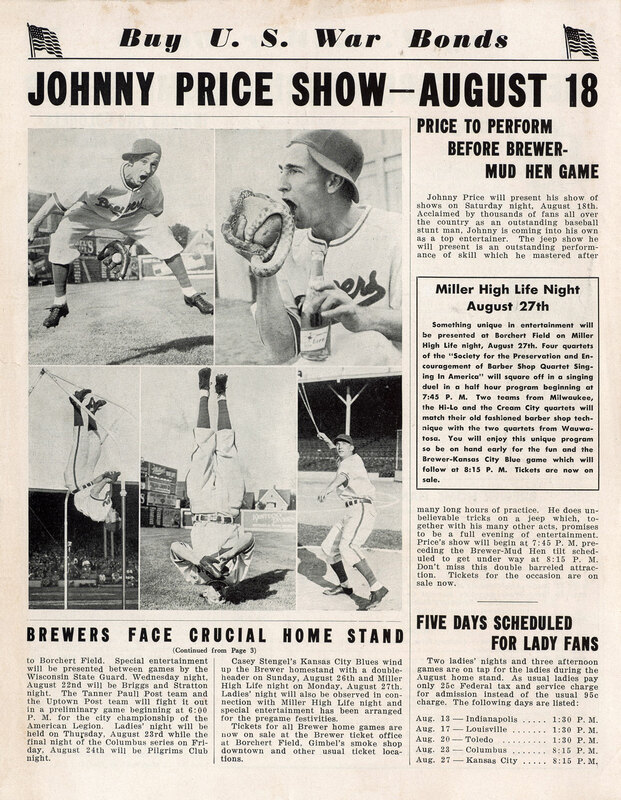 Johnny Price was a member of the proud tradition of baseball clowns. A longtime minor leaguer, he was known less for his glove and bat and more for his pet snake and balancing act before the grandstand. Price was a favorite of Veeck, who never missed any opportunity to entertain a crowd, and when Veeck bought the Indians in 1946, he soon brought Price's act to the big leagues. It wasn't all bread and circuses, though. Veeck had serious plans to expand his team's fanbase, and part of that was drawing in women. Five games on the August schedule—two nights and three afternoon games—gave reduced admission to female fans. And that's Vol. 3, No. 4. 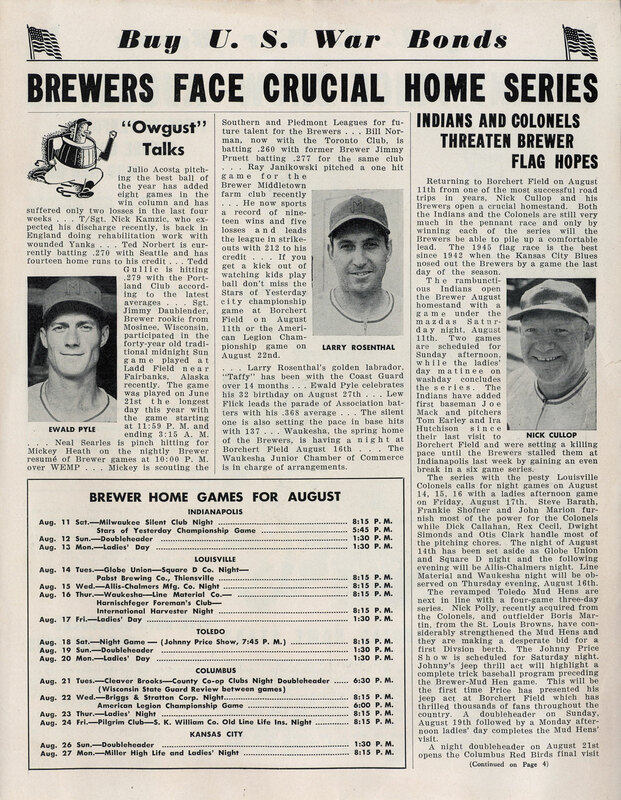 A little less content, thanks to the magnificent photo spreads, but a great look into what the Brewers were saying to their fans sixty-seven years ago.